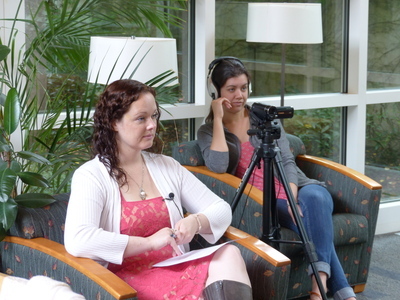 Linfield College archivist Rachael Cristine Woody and student assistant Shelby Cook listen to Juan Pablo "JP" Valot during an oral history interview at the Jereld R. Nicholson Library at Linfield College on July 19, 2016. Linfield College Archives, "Juan Pablo Valot Interview 06" (2016). Browse All Willamette Valley Oral History Interview Photos. Image. Submission 160.